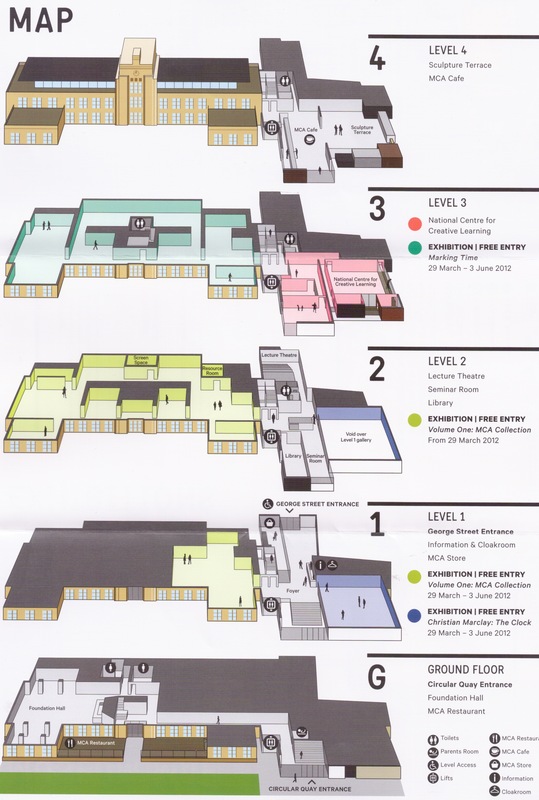 national gallery of australia | Paint later, a painter's blog. Fiona Hall was a very early influence on the way I thought about art. I had first seen her work “Dead in the Water” at the Art Gallery of NSW more than 15 years ago in a group exhibition and can’t recall the theme of the exhibition. She had drilled small holes in plastic piping and suspended them in a glass tank. I was impressed with the way she was able to get her message across and the skill in presentation. 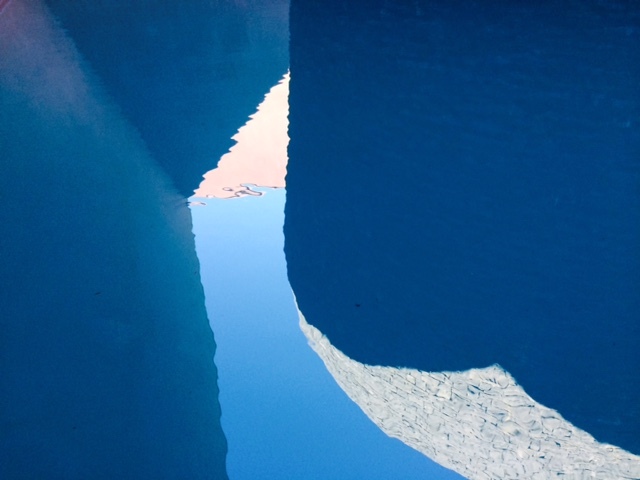 She was selected to represent Australia in the 2015 Venice Biennale and the show, Wrong Way Time, was displayed at the National Gallery of Australia in Canberra along with her earlier works in the NGA collection. The exhibition reminded me of her early exquisite drawings over bank notes that had made me first explore the qualities of gouache. Her ability ranges from the attention to the minutae to large sculptural installations such as Folly for Mrs Macquarie. The trip to the gallery reminded me of much I drew from her work and the idea of always experimenting with materials. The play may not come to fruition but there is never a wrong way. Everything old is new again at the National Gallery of Australia. A trip to see Tom Roberts meant an additional opportunity to take in old favourites in new spots. What a difference a re-hang can make! We missed some familiar faces but there was a chance to see what a wall and light can do for a work. Starting with Tom Roberts, we avoided the increasing crowds and got in early so we had him all to ourselves. This advantage meant we could go into the kids interactive room with no kids. I just wish there was a space like this for adults. 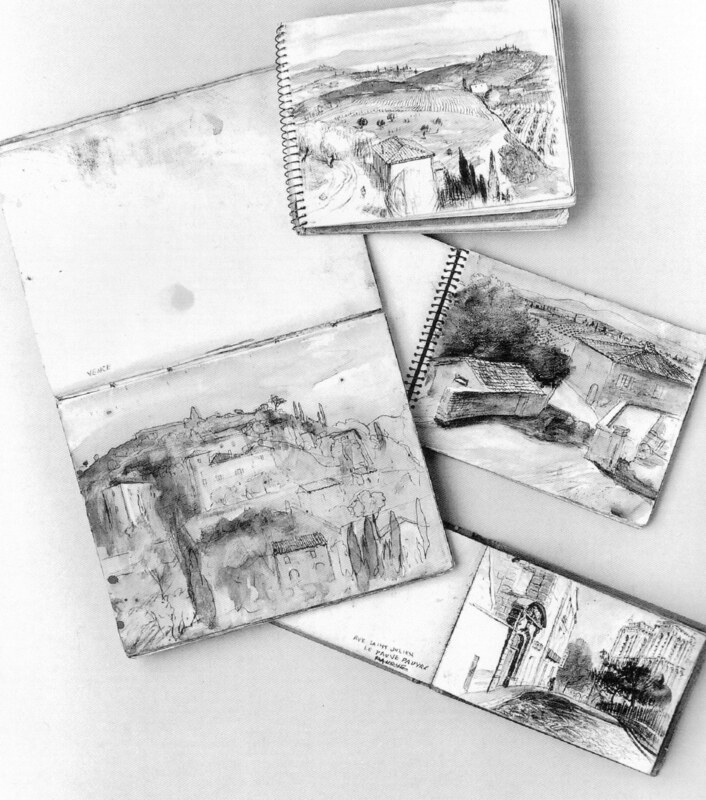 Little easels for re-creating portraits, dress-up, saddled lambs and an app projected onto a wall to allow movement of figures into the landscape in a playful way. Simply playing opens new and wonderful ways of working. Why do we have to stop? Standing in front of works studying the paint and structure is a wonderful opportunity to examine Roberts underglazing of luminous pink peeking from under the cracks, but how wonderful would it be to have a room to express that on the spot, to sketch without feeling slightly wanker-ish in front of gallery on-lookers. Upstairs the Tyler Graphics exhibition: Behind the Scenes, showed play at an expert and amplified level. Extraordinary works of printing and the use of paper pulp by Rosenquist and Caro left me wanting to shred, pulp and construct. 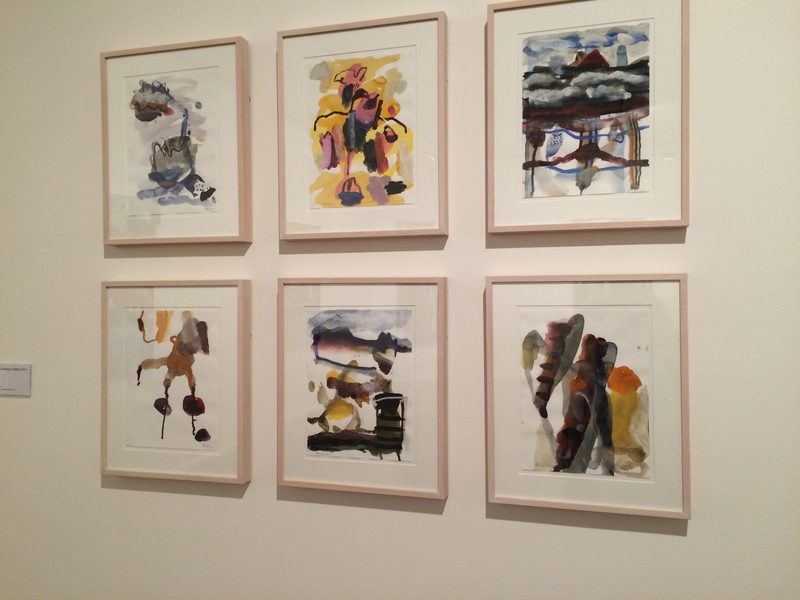 The fabulous line and strength of Joan Mitchell’s marks showed the ability to translate freshness into print. A sequence of short films gave an insight into the complexity and flexibility of printmaking and the process to produce Frank Stella’s “The Fountain” left me feeling nervous, exhausted and a newfound respect for prints of multiple techniques at this size. After the intensity of Roberts and Tyler, a small unobtrusive exhibition simply called BLACK pared it all back. The entrance lured us in with a glimpse of too abstract expressionist giants: Motherwell and Guston side by side. Inside Serra sat comfortably alongside ancient forms, the “ground breaking” blackness of Malevich and the light inside the darkness of Soulages. This exhibition was a fabulous use of stored masterpieces within the NGA collection. Darkness all aired out. 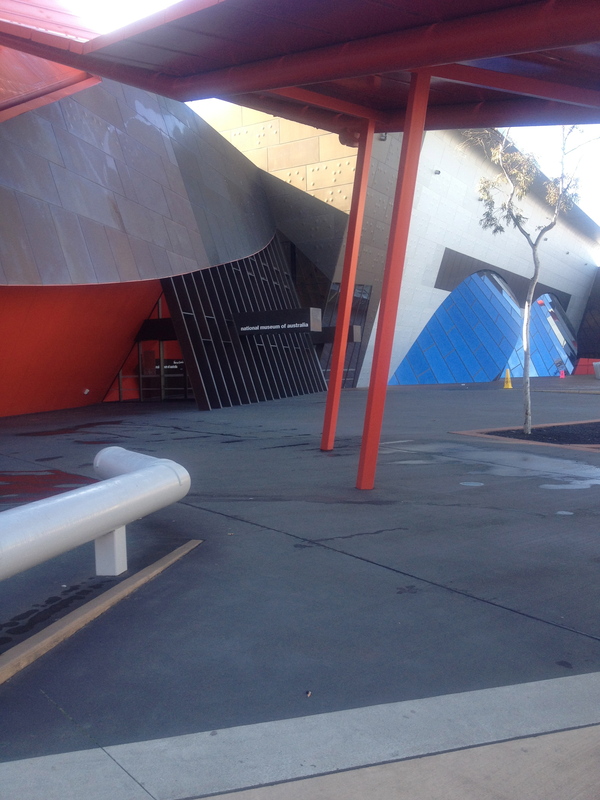 Above all the new hang and the changes within the NGA have been wonderful, a breath of fresh paint. Sometimes the order of exhibitions matter. Your head is in a space, ready for the onslaught. This time there was no plan as to who would be first. Ann Thomson’s exhibition Freehand was even higher than the expectations. Her works are full, yet light. Marks, space and colour give each other time. There is a lustfulness in the way she paints -a love of the space she creates by the marks with her body. It is not painting, it is not composing, it is absorption. 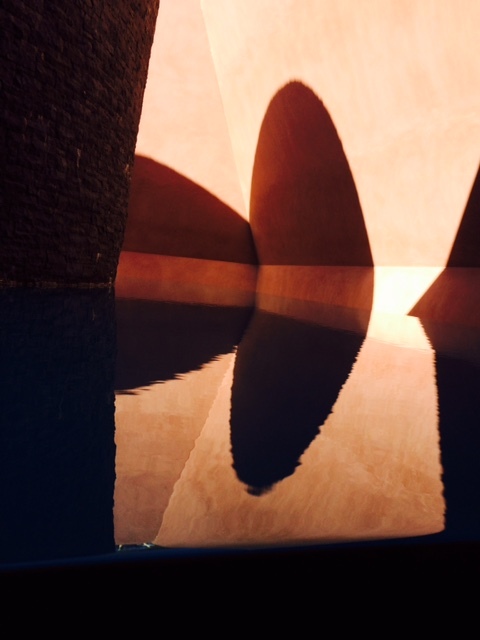 The nearby James Turrell Retrospective at the National Gallery of Australia in Canberra had a naked art night (no, I didn’t like the thought of bending over to put on the booties). The participants absorbed the light into their flesh. 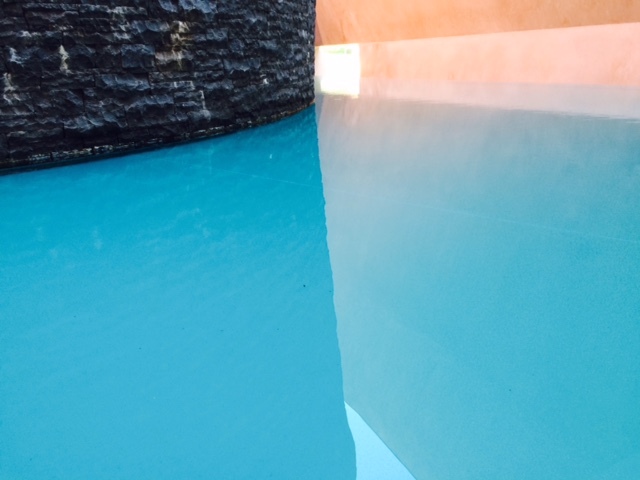 The Turrell show was a world away from paint using space, light and dark. 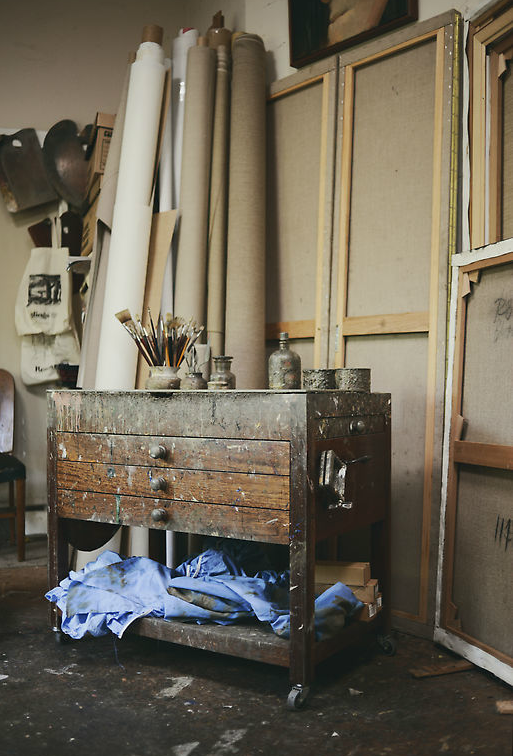 The show made me envious, why do I need a studio full of brushes and paint? A day earlier I was inspired by Ann Thomson’s work, it had made me want to paint again but the stripped down use of light as a material seemed to make sense. Marks seemed inconsequential. 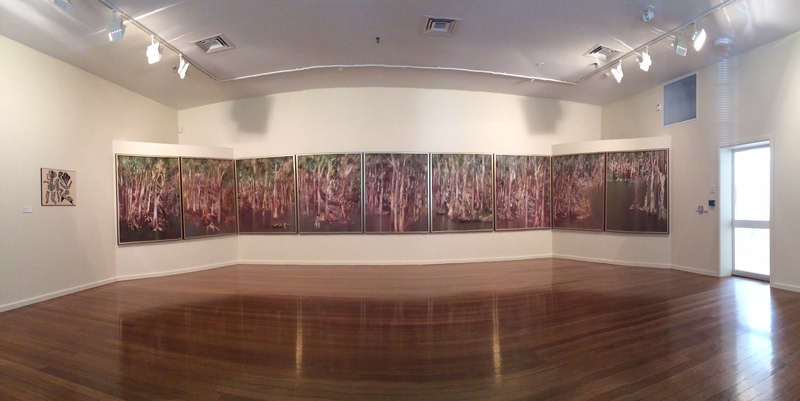 In between there were glimpses of Sidney Nolan, the Riverbend series at the Drill Hall ANU, an assortment at the Canberra Museum and Gallery and the Kelly series at the NGA. Somehow his works still resonated. There was the myth of place, I wasn’t in the desert creating huge skyspaces and I wasn’t in a studio surrounded by dripping paintings on white walls. I am caught in time, like Ned painted into a story of what my life has become, headfirst down a wombat hole. At five in the afternoon”. Garcia Lorca: Lament for Ignacio Sanchez Mejias. Canberra in winter is bitingly cold, a stark blue sky and cool grey concrete of the National Gallery seems like a world away from Spain and New York but the last couple of days I’ve felt the intensity of bullfights and the pain in painting. 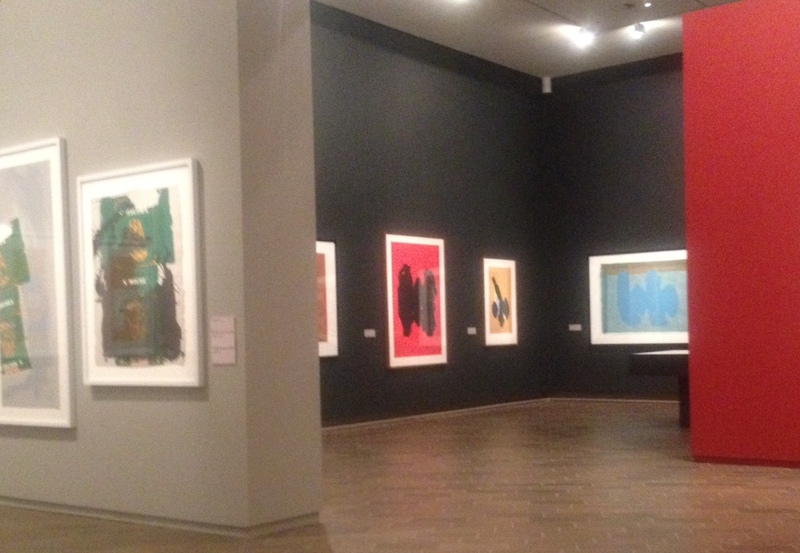 Robert Motherwell : At Five in the Afternoon currently at the National Gallery is a selection of prints from the Gallery’s collection and the curator Jane Kinsman gave a talk and some insight into Motherwells practice of printmaking. The works spread across three rooms were brilliantly curated and each work was fabulous but a selection of small lithographs were simple and exquisite and captured the same emotions of the larger striking painterly works. Some of the larger prints utilising graphics from cigarette packets reinforced that peculiar artist habit of finding inspiration in the mundane. 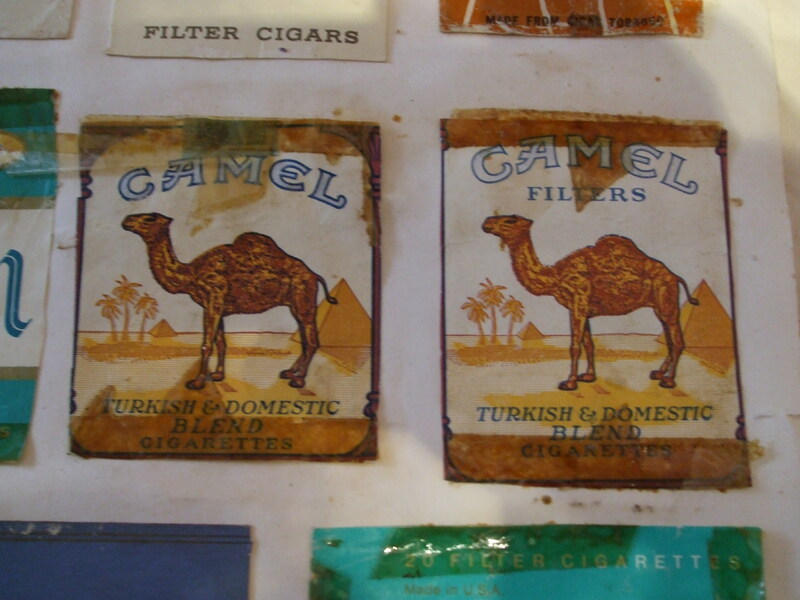 I remember as a child enamoured with the cigarette packets we used to sell in the boat hire business, Camel and Fiesta were my favourites but later I photographed old packets a friend had in their scrapbook for painted works not realising Motherwell too was drawn by the colour and shape. 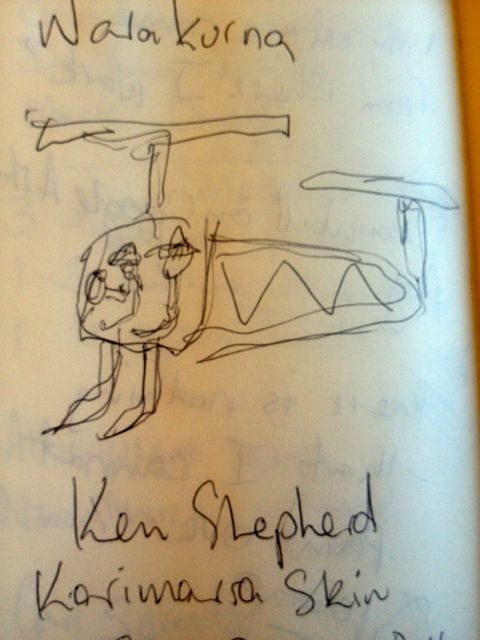 Up until stumbling across John’s curious arty collection, I had tried to draw a camel packet from memory. 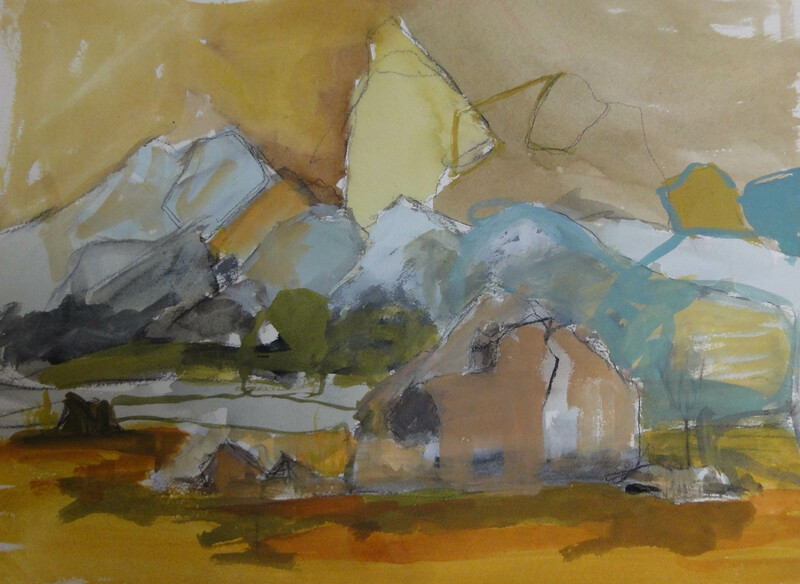 Motherwell’s prints incorporating imagery and my painted works, now capture a lost period. Smoking was acceptable and a filthy dangerous habit that I (for a short time) and Motherwell embraced. Packets were bright and engaging. Cigarette packaging in Australia is now a dark, dull, khaki green and the only images gangrenous limbs and health warnings. And I guess like any image, even cancerous body parts and minimalist packaging will provide some sort of inspiration for other artists down the line. After the talk, we hit the wine and felt glad Motherwell had chosen drinking and painting over suicide. We are so much richer for his work and his immersion in the poetry of Lorca. We went back again the next day for another hit before heading home, did a swing by the Indigenous and Australian gallery and we had a choice – down the stairs or back through the exhibition? I’D RATHER GO BY MOTHERWELL THAN A STAIRWELL. In the words of the Warakurna artists of Central Australia I was in a good and happy place, Walykumunu. For them that place was the arts centre in the Central Desert making art, for me it was the next best thing – looking at art. 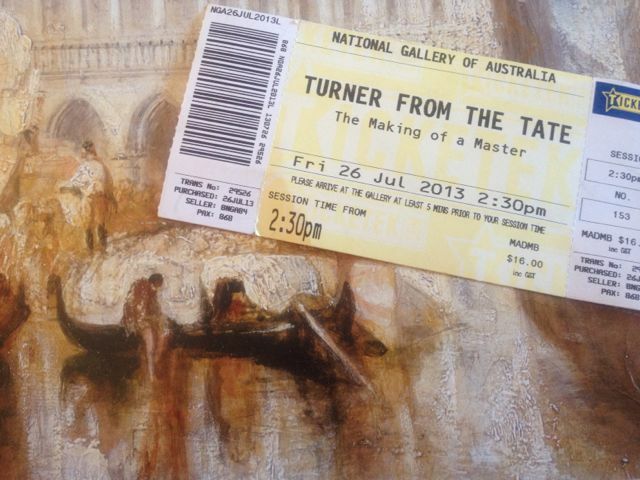 A little while back I went to Turner from the Tate exhibition at the National Gallery of Australia in Canberra. This visit was with my daughter and it was a last-minute decision based more on opportunity than intent. Her recent visit to London and her emotional encounter with Turner also drove us there. 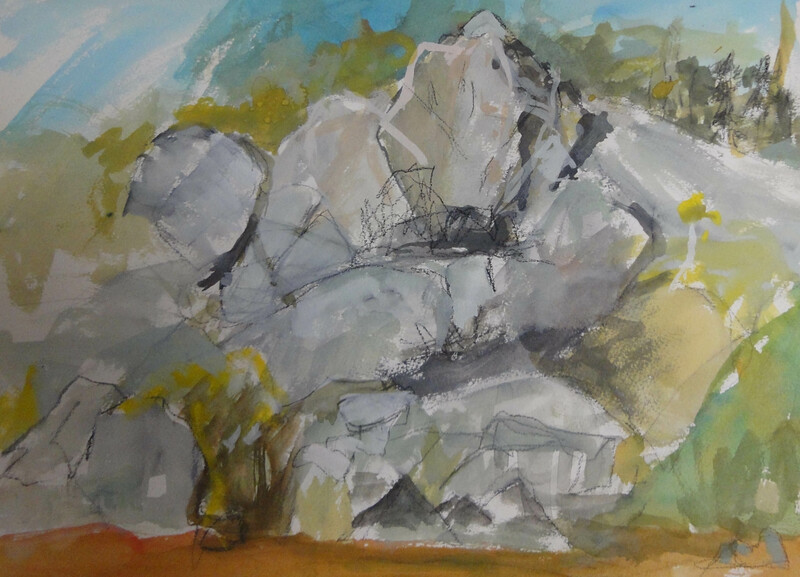 Last weekend my second visit was with my painting pal Jane and based more on intent and serendipity. The second look was different. The time-lapse between visits meant that I had considered works from a distance and returning provided the opportunity to draw on those remembered paint marks. This visit I swore I could smell oil paint in the room. 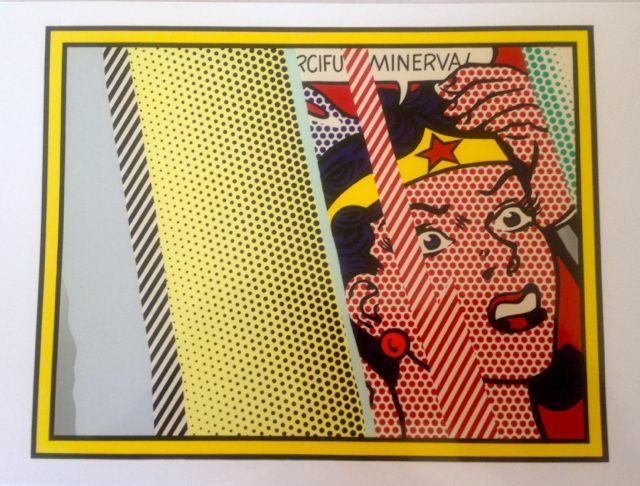 Upstairs Roy Lichtenstein’s prints in Pop Remix Exhibition told of the journey through Western art history in a totally unexpected way. His dots told stories of Abstract Expressionism, Still Lives and Nudes. At the National Museum of Australia the exhibitionWarakurna, All the stories got into our minds and eyes used very different dots to Lichtenstein. It was a coming together of different skin groups keeping their culture strong through various art forms, weaving, painting, sculptures, making bush medicine. Helicopter Ride with Brooksy to See My Father’s Ngurra (Country), 2011, Ken Shepherd, acrylic on canvas. Donated through the Australian Government’s Cultural Gifts Program by Wayne and Vicki McGeoch. Ken Shepherd’s Helicopter Ride with Brooksy to see my Father’s Country (Ngurra) left me feeling like an explosion of cultures. It was Turner’s narrative, Pop Art’s patterning and Indigenous understanding of life and art. 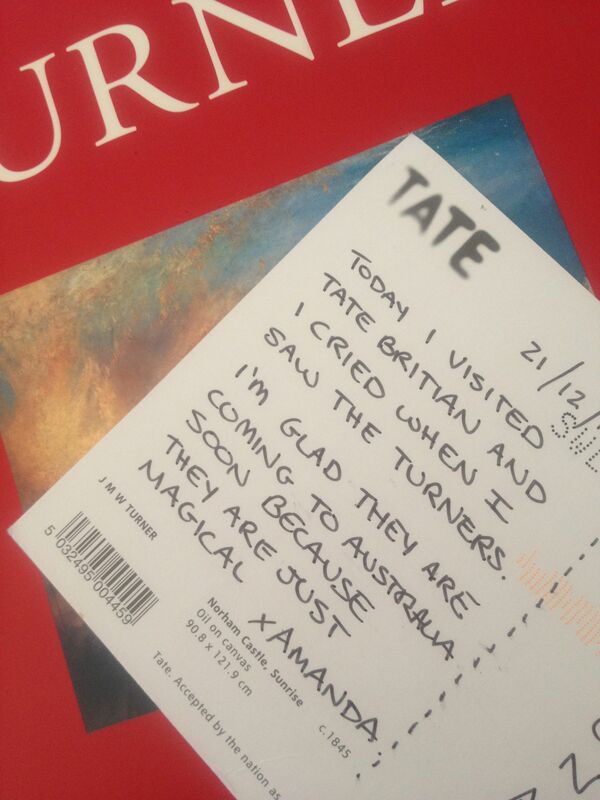 The Tate London is more than 10,000 miles away to the west and more than 10,000 miles away to the east is New York. Australia seems to be smack bang in the middle and I imagine an art sign post in the Central Desert of Australia with New York pointing one direction and another pointing to London. Underneath sitting crossed-legged in the red dirt Roy Lichtenstein and JMW Turner. Lichtenstein marking the sand out in dotted patterns and Turner sweeping large gestural marks through the dust. They both seem worlds away from the Warakurna Exhibition at the National Museum of Australia. All are Walykumunu, a good and happy place. Places that bring art together and keeps culture strong. You would think that these two artists couldn’t be further apart but there is something very similar about them. It was sad news that Jeffrey Smart, highly respected Australian artist died this week and on the other side of the world in San Francisco, the De Young Museum is holding a Richard Diebenkorn exhibition, The Berkley Years. 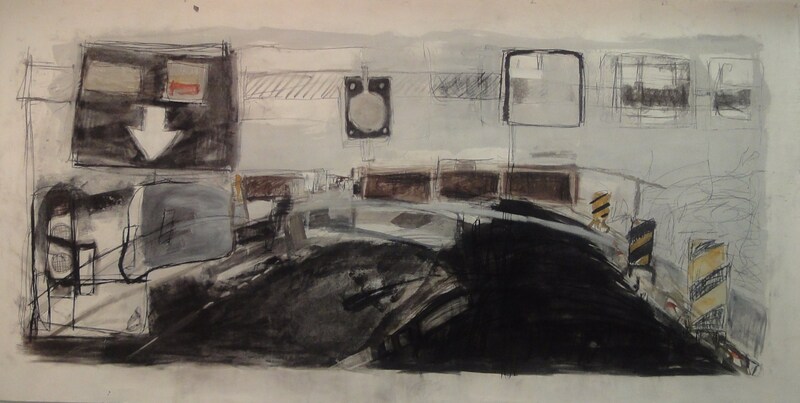 My trip to the USA a while back was primarily a search for Diebenkorn paintings (and De Koonings of course). The major Australian Galleries have no Diebenkorn paintings in their collections. The National Gallery of Australia has a number of prints and the Art Gallery of NSW have just 2 etchings not on show. There was no other option than to visit the source. Upon seeing them I realised it wasn’t just all about space and colour, it was the edges, where paint meets. Do I bring it up close and stop or push it over the edge of the next colour? Diebenkorn knew. At the same time as Diebenkorn was dealing with his edges during the Berkley Years of 1953-196, Jeffrey Smart was painting The Cahill Expressway in 1962 in Australia. Smart had chosen to use those edges differently, crisp and hard. Any artist familiar with Jeffrey Smart’s paintings recognise his roadside world and driving the expressway is becoming a figure within his composition. My trip to Berkley, thousands of miles from a Jeffrey Smart world, over the Bay Bridge, a flash of overpasses and underpasses felt as though the two worlds collided. I wonder if they knew of each other’s work. Both were influenced by the likes of Cezanne and Edward Hopper. 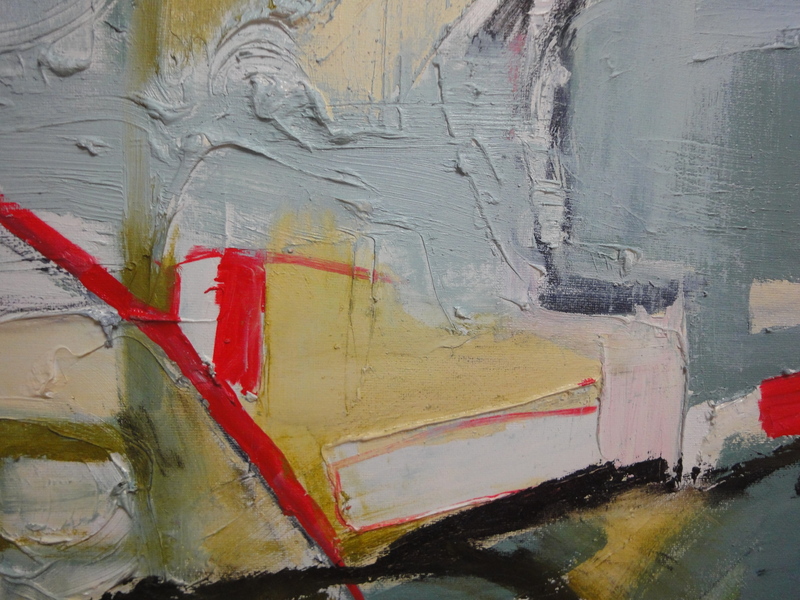 In the same way Smart and Diebenkorn have influenced my work. 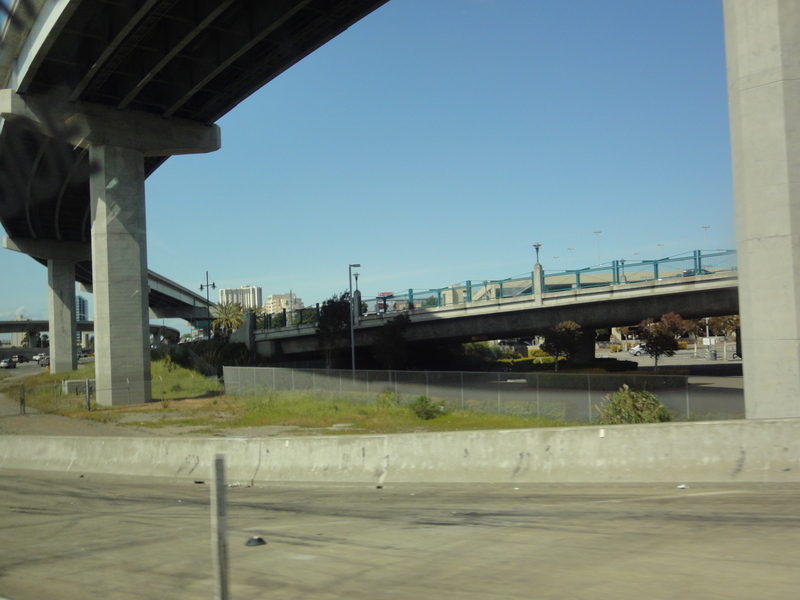 Fuzzy edges and overpasses. At the very end – the full stop is Peter Upward – a large slash of calligraphic crusty paint in June Celebration. 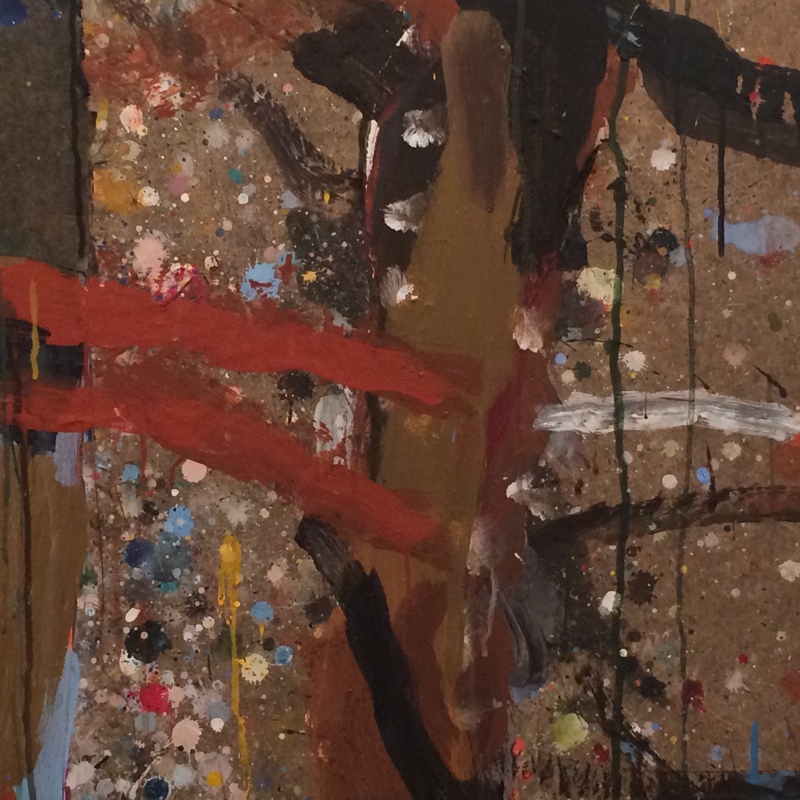 This work left me gob smacked at the symposium on Abstract Expressionism at the National Gallery of Australia. Seeing it for the umpteenth time hasn’t dulled the feeling when standing before it. This room, the last leg of the exhibition includes some important Australian abstractionist in Tony Tuckson, Ian Fairweather and Ralph Balson. The works will be the first to come down as the exhibition moves into the last throes. This end of the gallery has had a range of amazing exhibitions and despite feeling tucked away there is a feeling of intimacy with the works. I remember being down here with the Helen Frankenthaler woodblocks in Against the Grain and the Andy Warhol screen prints. Now I will remember being down there with Peter Upwards sister standing before June Celebration. The facing wall of works include Grace Hartigan and Franz Kline so will form the next post. So far I have explored the Abstract Expressionism exhibition at the National Gallery in Canberra room by room. My last blog, in the End of the Y I left out one very important painting. It was Philip Guston’s Prospect. I couldn’t wait to get to New York, home of the expressionists but Philip Guston was not on my wish list of art heroes like De Kooning and Diebenkorn. I’d always been drawn to his work but it wasn’t until I saw his early works en masse that I was hit hard by the oily Guston stick. Paintings on the wall never compare to books. This painting and all I saw of Gustons were fresh, like he painted them and left the room for a break and he would be back soon. It was also the area he left surrounding the push and pull of paint. 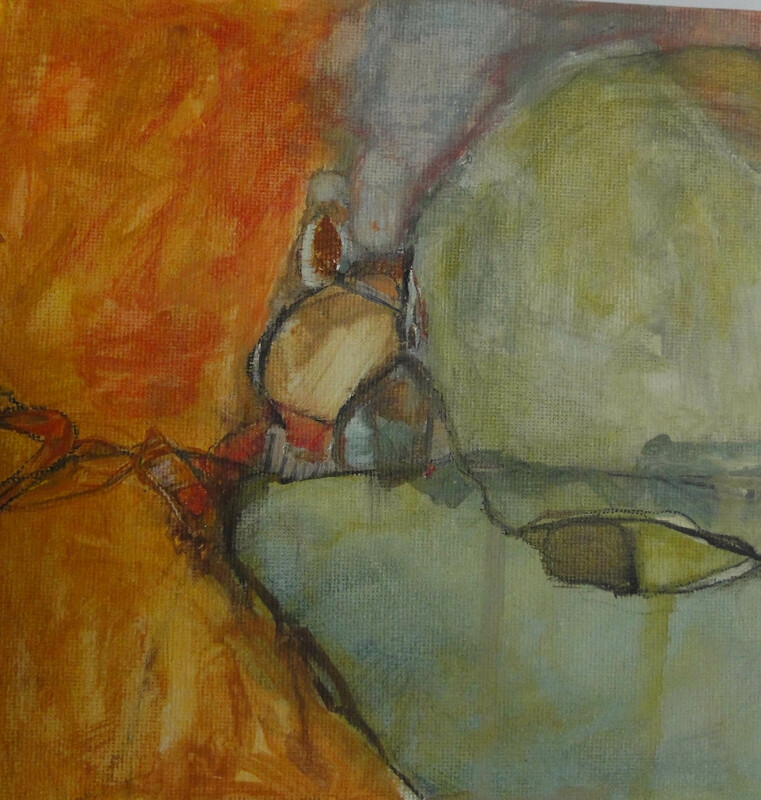 It was difficult for others to understand why he left this abstractionist style behind but in the book Night Studio by his daughter Musa Mayer it was what he wanted to do, to take himself out of what was expected by him. So I was pretty impressed by the inclusion of this work of his in the abstract expressionist group. Books just don’t cut it, you have to see the paint strokes. Somewhere in a sketchbook I have made a scribbled note of which painting the one above was but I do know it was a super close up of a work in San Francisco Museum of Modern Art. The work here is entitled Prospects dated 1964. I have always admired Rick Amor (my post Failure Was Never An Option). A couple of weeks ago I took this photo of his dog in the National Gallery of Australia Sculpture Garden. 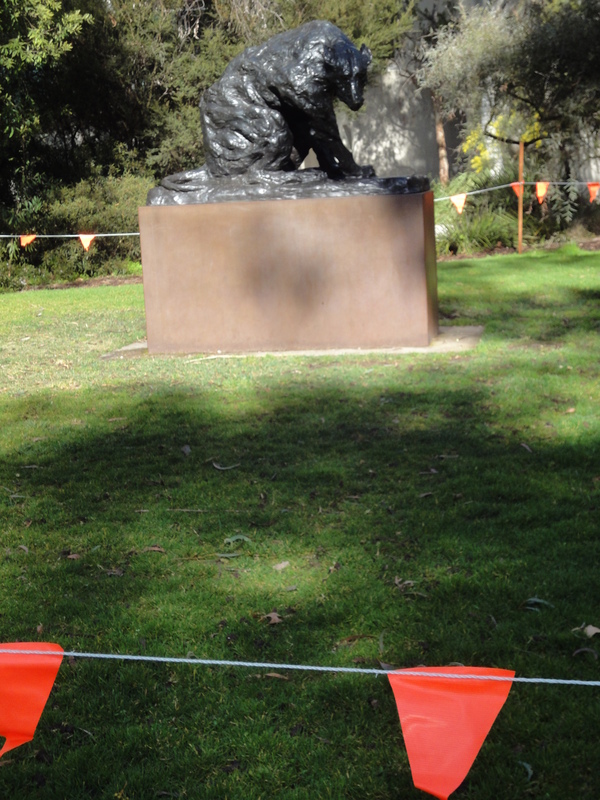 I was bemused at the procession of fluro bunting surrounding the sculptures. I thought maybe it had something to do with risk management or maybe it was just for grass regeneration. Either way I loved the surrounding bunting keeping the viewer at bay from the dog. Maybe it was to keep the dog in. Yesterday I came across this wonderful sharing of images on behalf of Dumbo Feather (a fabulous magazine). I’m looking forward to the article even though the images by Lauren Bamford have already said so much. Click here to see the whole slide-show. Just as I was preparing to write this blog, my stats showed I was 2 views short of 20,000 so I guess that after I publish this someone will be that magical viewing number. I won’t know who you are or where you are from but it feels as though alarm bells should ring, steamers descend around your laptop and I am there with a huge bunch of flowers. None of that is likely to happen but rest assured you have my thanks for bothering to notice what I do. 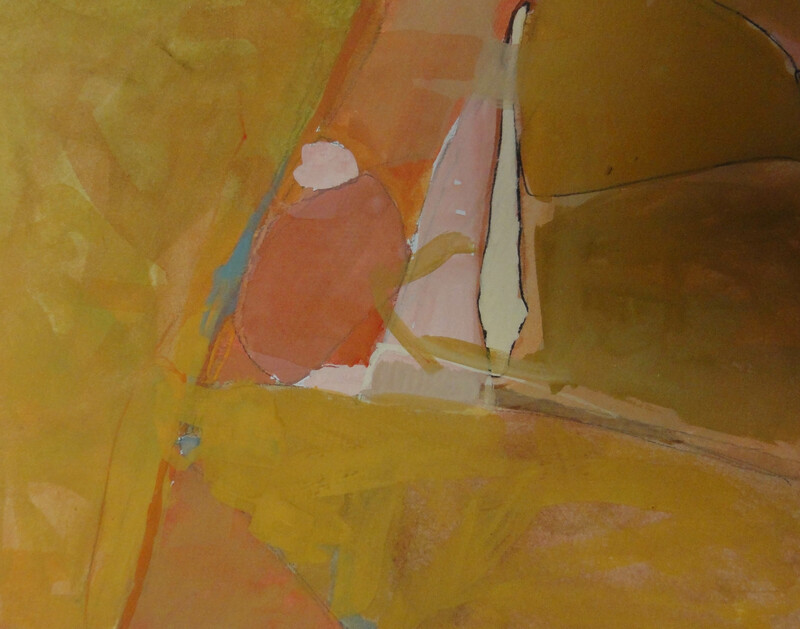 During the Abstract Expressionist Symposium at the National Gallery of Australia I had a special moment where I was alone with a wonderful work, studying the mark when a tall elegant lady approached -she was the artists sister. Later she caught up with me again and thanked me for liking her brother’s work. I was grateful for his legacy and she was grateful to know that he continued to inspire. So maybe it’s you who are the 20,000th and you just may have stumbled accidentally across this blog and like abstract work but I’m even more grateful for an avenue to share it.